In just under six hours, I lost the use of my legs. Not from an accident or an injury, but from transverse myelitis, a rare inflammation of the spinal cord that began as the flu, and for which there is no cure. I was thirty-eight. My kids were three, four, six, and nine years old. My divorce had been final for nine days. Although I&apos;d had the flu for about a week, I had no idea that the shooting pains that woke me early in the morning of February 12, 1997, would signal the beginning of a life with paralysis. Life can slip sideways so very quickly. When I was twenty, my seventeen-year-old brother died in a water-skiing accident. In my thirties, my firstborn son began having seizures at three months of age, which later became a degenerative terminal disease. My second-born daughter was diagnosed with autism; my youngest child was born with a rare blood disorder that put him in neonatal intensive care for thirteen days. Finally, life pressed in so hard on our marriage that my husband and I agreed that divorce was the best choice for both of us. By that time, I was ready to start a new chapter. Nine days later, the paralysis came. Excruciating pain knifed through my lower back, twisted, and then splintered down my legs, immobilizing each one. The last thing I moved was my left big toe, freshly manicured with a sparkly snowflake. Transverse myelitis affects one in a million. One-third of those affected recover fully, one-third recover partially, and one-third experience no recovery at all. Those kinds of statistics put me on one of the trickier paths when dealing with life-changing loss: the cautiously hopeful path. I&apos;d been down that path before. First, with my son&apos;s seizures, when the medical professionals told us that he could outgrow the condition. Then, with my marriage, when we began what became three years of counseling with the goal of reconciliation. Both times I had hoped for the best outcome. But it was not to be. In the hospital, I once again hoped for the best, praying with all my heart that I would walk again. Every day, I tried to move my left big toe. Meanwhile, my kids needed me. Madison, at age four, was nonverbal. Although worrisome, it is not uncommon for children with autism. In those pre-internet days, parents relied heavily on professionals for information. I was pleased with the care from our developmental pediatrician and the school-based autism outreach program she attended. Still, Madison had no words. She resorted to gestures and tantrums to let me know what she wanted. I became the decoder of her moods and motions, trying to anticipate her needs. It was exhausting, especially after the paralysis, when I was beginning my own struggle to decode my body’s new way of behaving. Two months after my hospitalization, a yellow flyer came home in her Barney backpack inviting me to a session about a new therapy that "helped Mason learn.” I immediately made arrangements to attend. It would be my first visit to another home from the wheelchair. Shockingly enough, the house was accessible. I bumped over one small step up and made it into the spacious family room and watched the presentation alongside other parents. Even more incredible, the therapy that worked for Mason also worked for Madison. Slowly, she began to learn words and small phrases, like "I want" and "Help me, please." It was in these seemingly small breakthroughs and tiny glimpses of progress that my hope and faith began to be restored. Those simple phrases changed our family life. I was determined not to let this serendipitous discovery be wasted. What might happen if parents could share their discoveries? Grateful for the courage of Mason’s mom, Polly Surhoff, and fired up by possibilities of finding more alternatives for our children, I began to work with Polly, her husband, B.J., and other like-minded parents on creating a parent-directed resource center. For three years, I threw myself into this effort. In February 2000, we celebrated the creation of Pathfinders for Autism. Despite my horrific, life-changing loss, I was able to do good work—life-changing work—for others. By that point, I had quietly given up on trying to wiggle my left big toe. Despite my horrific, life-changing loss, I was able to do good work—life-changing work—for others. I didn’t plan it that way, and to be honest, I’m not sure I even realized what I was doing until after it was over. But, looking back, I can now see that starting Pathfinders allowed me to focus beyond my circumstances. Perhaps it was my way to redirect the energy spent trying to wiggle that left toe so I could bounce forward. Rebecca Faye Smith Galli is an author and columnist who writes about love, loss, and healing. Her debut memoir, Rethinking Possible: A Memoir of Resilience, was published in June 2017 by She Writes Press. The parent of a daughter with autism, Galli is an officer and founding board member of Pathfinders for Autism, a Baltimore-based non-profit organization whose mission is to improve the lives of those with autism and their families. 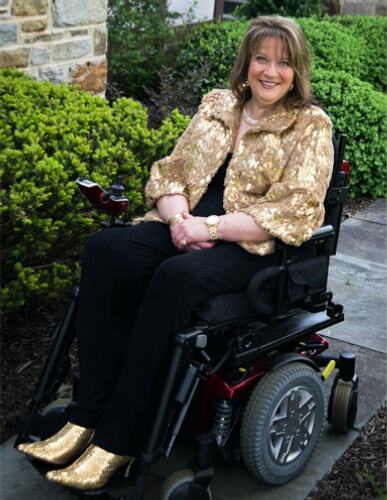 Galli is also an active member of the Transverse Myelitis Association, as well as previous board member for the League for People with Disabilities. Pathfinders for Autism, is now in its seventeenth year of operation. Its staff of eight — including one individual on the autism spectrum — served nearly 20,000 individuals last year.